Fishing in the Neighborhood (FiN) is a DNR program aimed at increasing angling opportunities, public awareness and environmental stewardship within the seven-county metro region. As the state's population has become increasingly urbanized, it has become evident that there is a growing need for easily accessible fishing opportunities close to where people live. FiN builds on existing urban fisheries management activities such as stocking, aeration and enhancement of shore-fishing and pier-fishing opportunities. By reaching out to a wider variety of interests, such as local parks departments, lake associations and schools, FiN promotes a greater awareness of aquatic habitat needs and the importance of good stewardship. 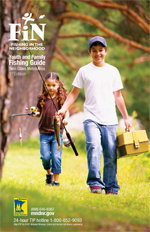 By getting more people involved in angling, FiN will assure that this family-oriented activity continues to be one of Minnesota's most popular pastimes! Use the menu on the left to browse through our information. For mobile devices with smaller screens, click the "Page Menu" button at the top of this page.